Purdue University’s Discovery Park Center for Global Soundscapes is embarking on a huge, continental scale project aimed to understand how animals will respond to the solar eclipse that will be occurring across much of the United States and Canada on Monday, August 21, 2017. Acoustic sensors recording from Alaska to Puerto Rico will collect audio data to help scientists to understand how an important cue like the sun affects the acoustic behavior animals like birds, crickets, cicadas, and frogs. Science museum educators, state park managers, national park scientists, and zoo personnel from across the continents are assisting to collect acoustic recordings and observations of sonic changes. 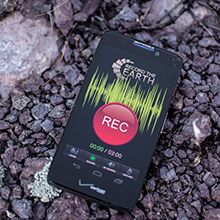 A citizen science app called Record the Earth will allow anyone to record the sounds before, during, and after the eclipse. Data from scientists and citizen scientists are being sent to the Purdue center for analysis. This web site provides background information for people interested in helping or learning about this rare study. During a solar eclipse, do animals that are typically active during the day stop making sounds? Do animals that are typically active at night start making sounds? How general are these patterns for birds, insects, mammals, amphibians, and even fish? Are any changes in sound production gradual or do they occur sharply? Are there any strange sounds being produced by animals? Studies like this one help scientists to understand how nature works, but more specifically, they can reveal what might trigger unexpected behaviors. Scientists are now observing that many birds are singing at night in urban environments because it is too noisy for them to successfully communicate during the day. How does a natural cause like an eclipse cause different behavioral changes than an unnatural cause like urban noise? Understanding how natural events and human activities affect organisms is vitally important as over 50% of all the planet’s species could potentially become extinct in the next century if we don’t gain a full understanding of the triggers of animal behavior.